Remote does not lite up. I love this player. The picture on My 53 inche sony is great with both DVD and LD. Very good as a CD player as well. Sounds like a PD65 elite . I am using a sonic frontiers sfl-1 preamp , sunfire amp , to mirage m3si speakers for 2 channel. For 5 channel I change speaker cables and run a yamaha rx-v850. panasonic dvd and sony LD player. I am quite pleased with my purchase even though it did take WAY TOO LONG to receive it from the local dealer. Once out of the box, I forgot my problems immediately and was amazed at how beautiful the unit was. I couldn't wait to hook it up. I am still in the dark ages since my television doesn't have component video input but I still found the picture to be leaps and bounds over the Sony laserdisc player that I have had for the past 10 years. I was equally impressed with the audio performance. I was hearing stuff that I couldn't hear before. I won't be using the unit for CD playback due to the fact that I don't like what the legato link conversion does to some cd's. I am very pleased with my purchase and would recommend it to anyone who has a large collection of laserdiscs and wants to make the unavoidable leap into DVD. Versatility - You name it, it plays it. Great Picture and sound Quality. Given how long this unit has been in Pioneer's lineup, I fear that it's the last combo player they will make, so I had no qualms about upgrading my DVL-700 to this model. It's unfortunate that we probably won't see the likes of this unit with features like MP3 palyback or Progressive-scan capabilities. Looks like I'll have to eventually supplement this combo unit with a dedicated DVD player at some point. Like most Pioneer Elite products, it's pretty to look at. Wood sides, and a nice glossy finish. Build quality is excellent, with a copper chassis and heavy-gauge steel all the way around. It's really deep, though, to handle the auto-reverse mechanism....so don't think you're going to slip this in a standard audio cabinet. The remote has alot of goodies that I'll never use, and some of the menu functions are less-than-obvious, but it's got 'em if you need 'em. Picture quality is first rate on my Mitsubishi 58" HD set via the component outputs. Alas, it's not progressive-scan, so the TV has to make up for this by displaying in 480i or 960i mode. Sound Quality is great as well. I use a Pioneer VSX-09TX which still has the LD RF inputs, so I get Dolby Digital regardless of my source material. Be forewarned, if you expect to get DD from laserdiscs you need a receiver with AC-3 RF inputs or an RF to digital converter (such as those made by Nakamichi, and these are getting rare). The digital out will only provide DD from DVDs. The loading process takes a long time compared to a dedicated CD/DVD player. It seems to take about 30 seconds for the player to figure out what kind of disc you inserted. Also, the loading motors are loud, but I guess this is to be expected given the size and heft of a laserdisc. This is a sweet unit for the person looking to have all formats in there stereo system. After having the 909 for a couple of months and know picking up a dvl-91 at what to me was a steal for a brand new unit $800, I have to say that this unit is far superior to the dvl909 according to pioneer the only differences are the dts decoding for the dvd's and the legato link for audio cd's but when I saw my movies in dvd the other night I could see them much clearer and sharper. Not only that but the chasis is a work of art finished in the gloss black with the side panels in the rosewood it is beautiful and the remote is twenty times better than the rinky dinky remote of the 909 all and all I am very satisfied that I was able to pick up this unit I bet that Pioneer is coming out with a DVL-92, in the next couple of months and they liquidated there inventory for these,the new one will be the same but with the 96/24 for audio, who cares for the price I'll sacrify that. I have mixed feelings about the DVL 91. As to sound and video performance, I have not seen better (to be fair, I have not auditioned any of the truly high end DVD or CD players as they are out of my reach price wise). I am satisfied with its performance. However, I have had significant problems with the quality of Pioneeer products. I had a CLD 79 elite LD/CD player in the shop 6 times for the same problem. I kept my fingers crossed when purchasing the DVL91, because it shares many of the 79's componentry. Guess what - - after 3 months, it started "eating" CDs, meaning that they'd get jammed inside. I forced Pioneer to exchange the unit for a new one (you can do it, but you have to be very pursuasive - - telling them of my CLD 79 problems helped). So far, no problems have arisen (and yes, I'm still keeping my fingers crossed). And to give Pioneer credit, they even repaired my CLD 79!!! Oh, one other thing. I think its a shame that Pioneer cheaped out and did not provide an illuminated remote with the player. So, bottom line - - if you've got to have a DVD/LD combi player, the DVL 91 will do the job. Just be sure to get the extended warranty, and be aggressive in dealing with Pioneer if problems do arise! The DVL 91 is sufficient for most people. You'd only buy it if you had a LARGE collection of laserdisks, because most significant movies are being rereleased on DVD, and the sound&video of the DVD's generally (but not always) are superior to the laserdisk version. However, Pioneer LD's have had some significant quality problems. I had a CLD 79 b4 the 91, which was in the shop over and over (until the warranty ran out actually). Never could get it fixed. I purchased the 91 to replace the 79. Guess what - - within 3 months, I had to take it to the shop. It was (this sounds bizzare) eating CD's. They'd go in, and somehow get jammed inside! (and no, I wasn't doing anything wrong). After the second occurance, I talked Pioneer customer service into replacing the unit. So far, no similar problems with the new unit (but I'm nervous every time I put in a CD). Additionally, to give credit where credit is due, Pioneer repaired my 79 at no cost. Other than the quality concern, the 91 has a couple of other negative points. First, its remote is not illuminated. That Pioneer cheaped out on one of its flagship models is an indication that even they realize that LD's time is past. They could easily have included a modified version of the 79's illuminated remote. Secondly, the menu is oftentime confusing. But, that is a problem you can find with other units (I often wonder why don't they have native english speakers design menus as well as write the manuals - - there is always something lost in the translation). On the positive side, the unit does have great video and sound capabilities. I doubt many people use their Legato link, but its there. Also there is some controversy as to whether or not the unit is 96/24 or 96/20. I've seen write-ups that say either. For most people (i.e., excepting those with significant LC collections who don't own a CLD 99), the DVL 91's not needed. Trade in your LD's or keep your existing player, and invest in a decent DVD only unit. You'll save yourself a lot of money. For the few people who will need a LD unit, and aren't satisfied with their existing unit (or, have to replace it, like I did), the 91's a logical choice. However, I'd urge you to invest in the extended warranty. I'd also suggest you check out the corresponding non-Elite model. Its probably substantially less expensive. For a rating, I give the 91 5 stars, but I'm subtracting 2 for quality and lack of an illuminated remote (Pioneer deserves a slap in the face for being cheap but charging $1,800 for the unit). I just picked up this unit brand new at Atlantic Stereo in Costa Mesa for $600.00!!! What a bargain this thing blows away my Pioneer Cld-704 that it replaced in Laserdisc performance. The DVD performance is great also. It works great with my Monster Z series S-Video cable and my 32" Sony XBR. It is the Jack of all trades of home theater and for $600.00 I might as well have stolen the thing. Highly Recommended. Versatility, Top Quality audio/video output, remote, styling. This is my first and last LD/DVD/CD combi player. I have research this unit for the last eight months, debating should I or shouldn't I buy this unit. I finally gave in to my urge and bought it. I received it double boxed from J and R. Thanks Andrew. Being that this is my first LD player, I must say that this unit has excellent picture quality. Given that I will only use it for LD playback, I think pioneer should only invest in stand-alone LD players based on the quality of this unit. However, I think the warranty should be 6 years instead of 2years. That is, 2 years for each format. Given that all of their Elite line carry a 2 year warranty. 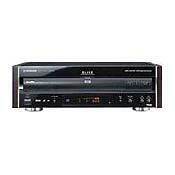 In addition to the Denon DVD 5000, I have the Pioneer Elite DVL-91 combi player. As with the DVD 5000, I feel I have a good handle on the DVL-91 performance when it is compared to other DVD, LD or CD player out there. Unlike my DVD 5000, I use the DVL-91 for laserdisc playback only. I play DVDs and CDs on the DVD 5000 because of its unmatched quality. Some of the movies I have viewed since I bought the DVL-91 in November include the Dolby Digital AND DTS versions of the following moviews: True Lies, Hunt for Red October, River Wild, Jurassic Park, and Lost World. On the Dolby Digital side only, I must have seen at least 10 others. The picture this unit produces is better than any other LD I auditioned back in October/November while hunting for the best LD player I could find. Not only oes it play DTS movies, you can do great things with the extra features. For example, the fast forward/reverse functions make it very easy to pinpoint where you want to go. The sound is excellent too. Again, I have primarily used this player for laserdiscs. I did one time play a CD on it. It sounds like a top end DVD player. In fact, it gives the Pioneer Elite flagship DV-09 (I think that's the model #) a good run for its money, though the DV-09 is just a tad better in video quality. Sound is exactly the same. I know there are many other options on it but I never use them. I am the basic playback ff/reverse when necessary kind of viewer. As stated above, I wanted to have the best LD I could find to go along with the rest of the theater which already includes the DVD 5000. If there is a better player out there, they do not sell it in the metropolitan Chicago area. I went to just about every specialty A/V store around here. My recommendation is this: if you want the best LD player available and a solid DVD/CD player, this all in one combi player will do it. If you don't mind shelling out more money, you should get the Denon DVD 5000 for DVD/CD playback and the DVL-91 for LD playback. At the price of $1,800 list, you do pay for it. When you total the cost of the 2, including tax, it is over $4,500. To me, it is worth the extra so I can rest easy knowing I have the best movie source units available. Go for it! PS -- My next purchase in the next 3-5 months will be the Sony DSS Dolby Digital satelite.